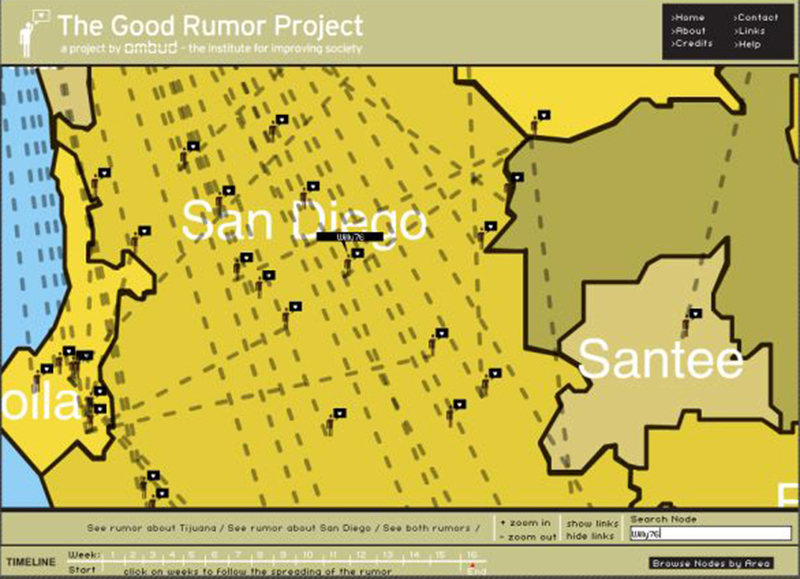 A social experiment that explores the possibilities to invert the more common negative effects of rumor through the construction of a “good rumor” that is systematically spread and tracked through the border region of Mexico and USA. Everywhere there are people there are rumors. Especially in urban areas where social and cultural groups are segregated and rapid change is experienced, rumors flourish. Rumors can be defined as “unverified and instrumentally relevant information statements in circulation that arise in contexts of ambiguity, danger or potential threat and that function to help people make sense and manage risk” (DiFonzo and Bordia 2007). Rumors contribute to prejudice, discrimination and, in worst cases, violence among communities (Solomos, 2011). Online rumors often create a viral tide transforming a false fact into a presumed reality. The reason for this is that rumors help to project a positive self-image and consolidation of one social group by ascribing negative characteristics to individuals outside this group. As a result, rumors often reinforce the sense of difference between cultural and socio-economic groups, and contribute to the process of establishing an “us” and “them”. Rumors generally run rife in conflict areas, and have played a key role in igniting episodes of intense violence, from ethnic riots to genocide (Greenhill, 2010). Several of the clashes among communities in urban areas over Europe have, consequently, either started with or have been enhanced by rumors (Solomos, 2011). Social media can also be seen as “echo chambers” of rumors where people’s opinions are reinforced by like-minded voices (Sunstein, 2007), and where this homogeneity is reinforced by information “filter-bubbles” that present information based on earlier searches (Pariser, 2011). The Good Rumor Project is an interdisciplinary project that explores rumors as a socio-political and cultural phenomenon. The project was commissioned by InSITE, an international public art institution which invites artist to conduct long-term interdisciplinary projects in the public domain which deals with the socially and politically sensitive border area between Mexico and the United States. 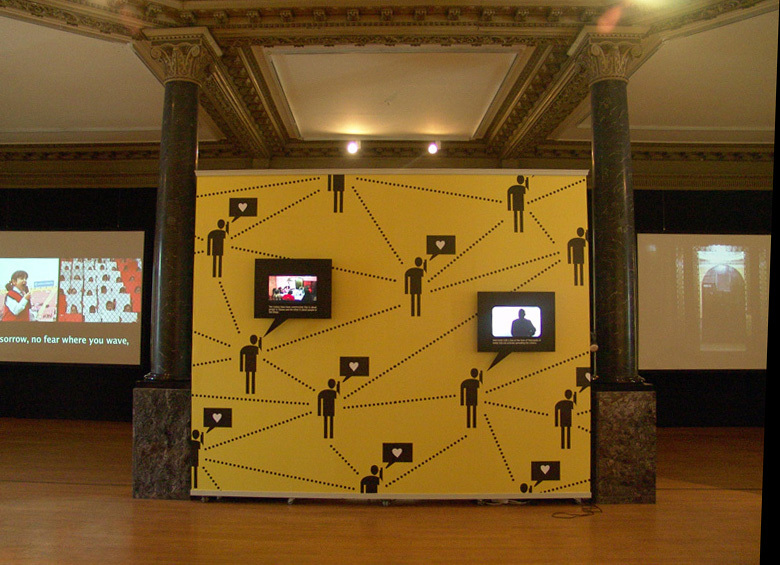 Curators of InSITE 05 were Osvaldo Sanchez, Ute Meta Bauer, Adriano Pedrosa, Mark Tribe, and Sally Yard. 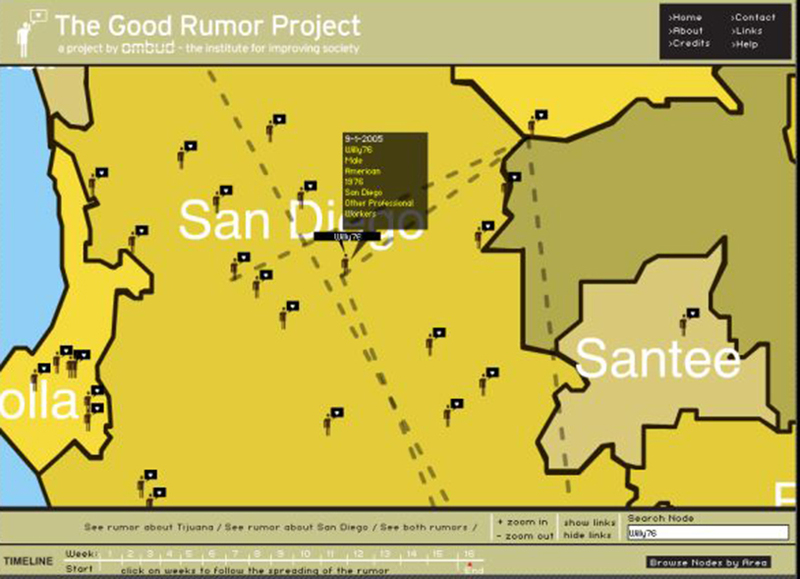 The Good Rumor Project was conducted in collaboration with Don Sciblimpaglia, Professor of Marketing at San Diego State University; Fiamma Montezemolo, Professor of Anthropology at the Department of Cultural Studies, El Colegio de la Frontera in Tijuana; Yonke Art in Tijuana, Dream Addictive Laboratory, Tijuana and Igor Isaksson, architect. Two rumors have been constructed by the project group: One about people in Tijuana that is spread in San Diego, and one about people in San Diego that is spread in Tijuana. In contrast to normal rumors, the “good rumors” have been created in dialogue with the actual subjects of the rumors. That is, the rumor about Tijuana was created by people from Tijuana and the rumor about San Diego was created by people from San Diego. This was done with the same methods as used in marketing as well as in politics for getting information on how people think about various items and issues: Focus groups. 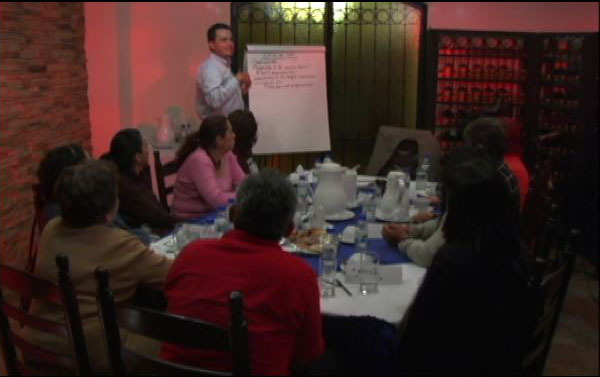 One focus group was conducted in Tijuana and one in San Diego. 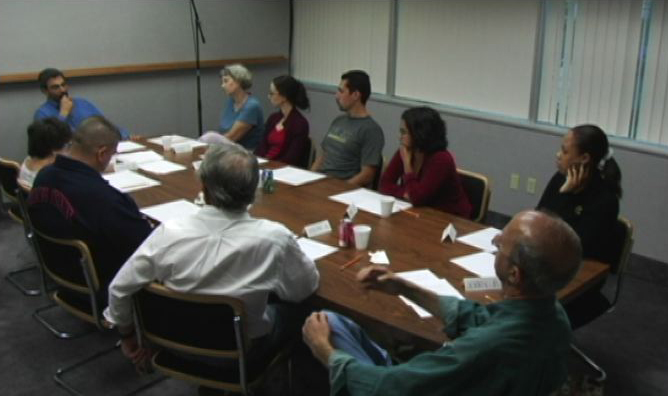 The focus group sessions were planned and led by professional focus group moderators, one from Tijuana and one from San Diego. 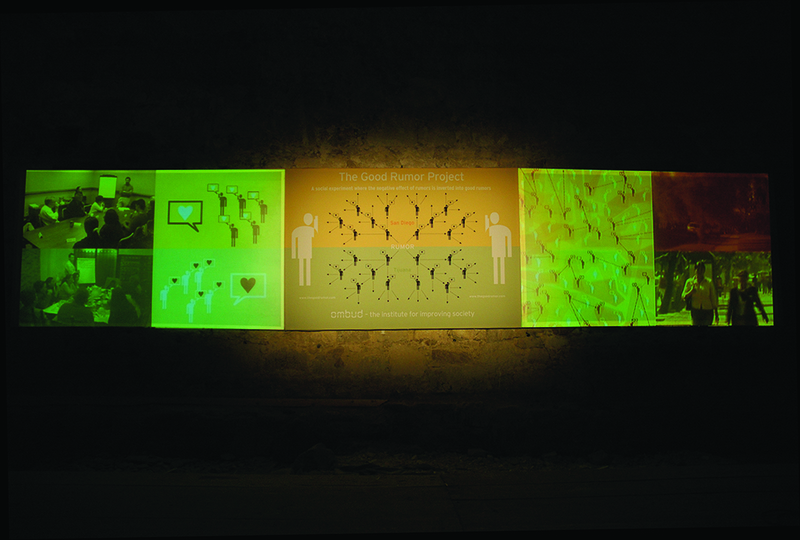 The result of the focus group sessions then functioned as the material for the construction of the rumor, which was done collaboratively by people from anthropology, marketing, art, and media from Tijuana and San Diego. Screenshot from the documentary on the project. 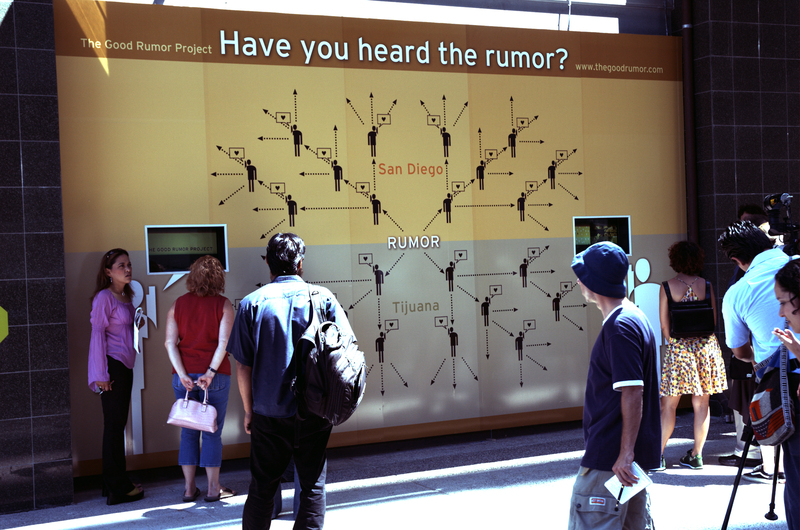 The “good rumors” were systematically spread in Tijuana and San Diego through a multifaceted strategy that combines some of the latest and most advanced marketing techniques –viral/word of mouth marketing – with recent sociological research on small-world networks and social network analysis. A few hundred persons from every level of society, who are influential in their respective social networks, have been targeted and contacted by the project group. These socially influential persons – in the project called “nodes” – were then invited to collaborate on the project by spreading the “good rumor” in their respective social network. One of the workshops with a group “nodes” from San Diego and Tijuana. In the workshops, the structure and purpose of the project was presented, as well as earlier projects that Måns Wrange has worked with. In addition to this, the nodes wer also asked to invite three new persons who will function as nodes by continuing spreading the rumor and inviting three new nodes and so on. In this way the two rumors have been spread exponentially in Tijuana and San Diego. Finally, each node had also to sign up on website of the project — www.thegoodrumor.com or www.elbuenrumor.com — in order for the rumor spreading to be tracked. 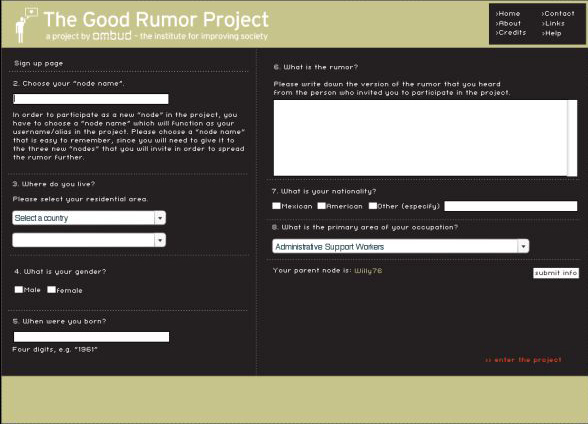 Screenshot of the website of The Good Rumor Project with the sign-up form for the nodes of the project. 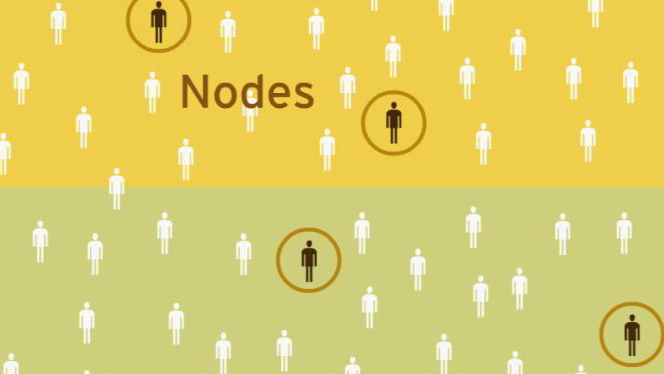 When signing up on the website of The Good Rumor Project, the nodes are asked to submit some demographic data indicating age, gender, nationality, area of occupation, and residential area in order for the project to be able to trace the spreading of the rumor geographically as well as demographically. The nodes will protect their anonymity by using a “node name” (a username/alias) instead of their real name. Lastly, the nodes have been asked to write the version of the rumor that has been transmitted from the the node who recruited them respectively. Screenshot of the website with an interactive map which shows the spreading of the two rumors. 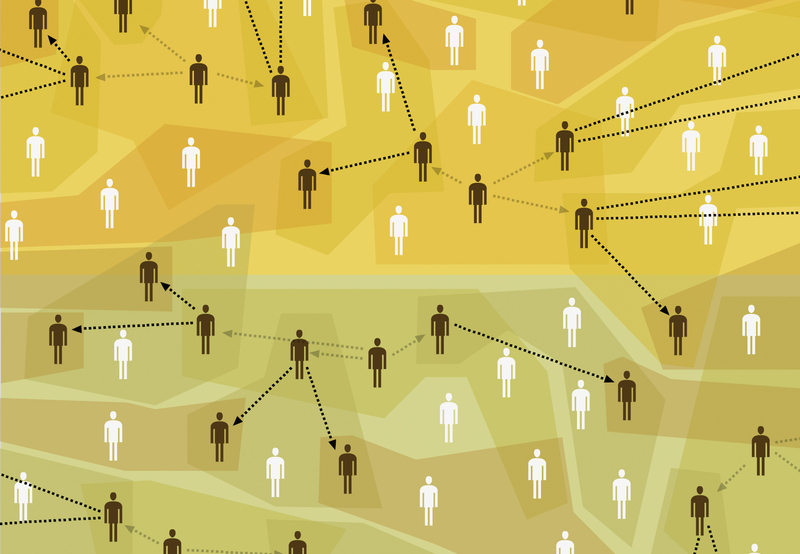 The submitted information is fed into a database connected to a an interactive interactive sociogram on the website, where the rumor spreading can be tracked geographically, socio-economically as well as narratively from node to node through the border area. The rumor spreading by individual nodes can be traced by holding the cursor over the pictogram icon which represent a particular node. A window with the demographic facts which the node has filled out while signing up on the website, will be shown while clicking on the pictogram can, which offers the possibility to tracked the rumor spreading socio-economically. The chronological development of the rumor spreading in time can also be can also be followed on a time line on the bottom of the website. A second part of The Good Rumor Project is currently in progress and will be finalized in 2017. A 3-minute trailer for a 30-minute documentary in collaboration with the Yonke Art, Tijuana, that addresses the key stages of the project: the development of the rumors, the media campaign, the strategies for dissemination of the rumors, the evolution of the rumor spreading, and the wider impact of the project. 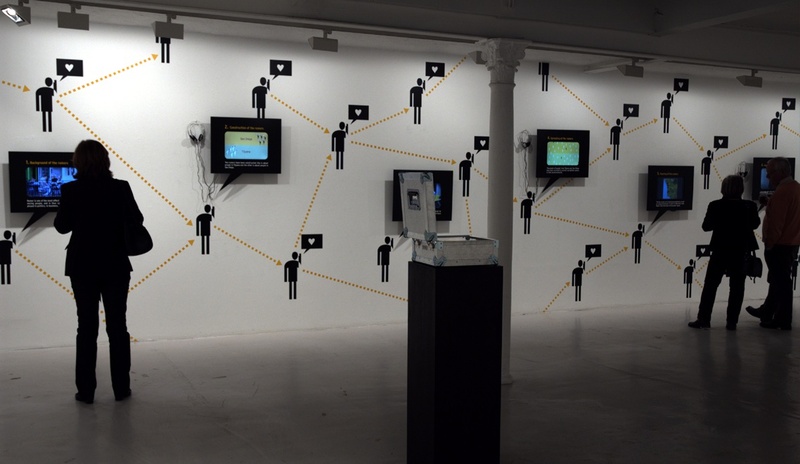 Installation at Gallery Andrehn-Shiptjenko, Stockholm, 2007. 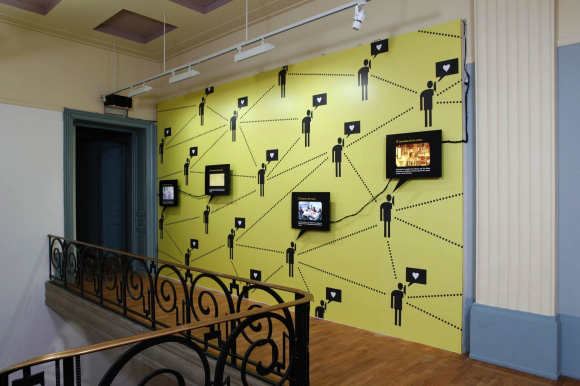 Installation at “Soft Manipulation”, Casino Luxembourg – Forum d'art contemporain, Luxembourg (curated by Enrico Lunghi, Maria Lind and Zoran Eric), 2008. 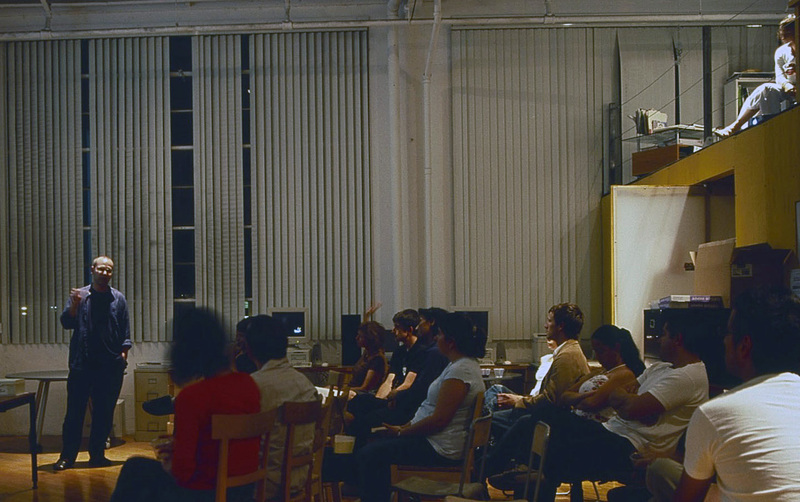 Presentation of the project at InSite, San Diego, 2005. Presentation of the project at "Continental Breakfast", Muzeum, Ljubljana, 2005. DiFonzo, N., Bordia, P. (2007). Rumor, gossip and urban legends. Diogenes 54 (1):19–35. Greenhill, K., Weapons of Mass Migration: Forced Displacement, Coercion and Foreign Policy (Cornell Studies in Security Affairs, 2010). Solomos, J. Race, Rumors and Riots: Past, Present and Future, (2011) Sociological Research Online, 16 (4) 20. Sunstein, C. R. (2007). Ideological amplification. Constellations, 14(2), 273-279. Sunstein, C. R. (2001). Republic.com. Princeton, N.J.: Princeton University Press. economy, somehow enunciated through social flows. Yet I am still in the dark, I remain ignorant of the actuality of these rumors; the information remains withheld, and with the frustration there comes a resignation to the notion that we don’t need to know everything, to understand all. Just to smile, and imagine what the rumors might be."